Welcome and Namaste. This is Sedona, the Metaphysical and New Age Capital of the World. Life is different here. The intense energy of the land, the magnificent Red Rocks is believed to heighten human consciousness. Some say that the iron oxide in the rocks creates an electromagnetic interaction with the human energy field. That's as close to a scientific explanation as we may ever get. Whatever it is, there is no denying that this place has power. As a result, people from many realms of the metaphysical and spiritual lifestyle are attracted here. Like a magnet, Sedona seems to choose people and facilitate their ability to remain here, for whatever purpose, whatever calling. The result is a population that lives every day with the one understanding that we are all part of a single consciousness. Everything else springs from that understanding. Here, you find an enormous collection of artists, musicians, talented psychics, readers, healers, yogis, alternative health providers, spiritual revolutionaries and more. Our site is all about sharing Sedona with you. We hope you enjoy our products and your satisfaction is unconditionally guaranteed! We are - The Ronald James Television & Media, Inc. family of companies. Sedona Media Company - Media Manufacturing and Publishing - Distributing over 50 Sedona Related Media and art products you won't find anywhere else! Ronald James Television - TV and Video Development and Production. Stage 3 - 3000 square foot soundstage and production facility for live events, infomercials, TV shows and more. 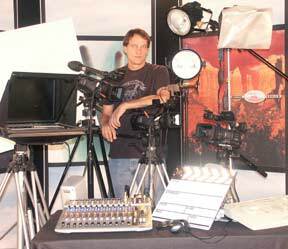 Producer Ronald James left a promising career in mainstream television to create conscious media titles here in Sedona. "Every title we create is about helping people to learn, bringing enjoyment, and celebrating the incredibly mystical place we all live." Winner of fourteen national awards in media arts, James creates his own films and videos and markets them on a grass - roots level through his own distribution company. "We like to get to know our clients and make sure that what we are giving them works for everyone." We hope we can work with you to expand your retail lineup and further your success!